Let’s get back to basics and head into the utility sector. Dominion stock is arguably my favorite personal dividend stock holding. Why? 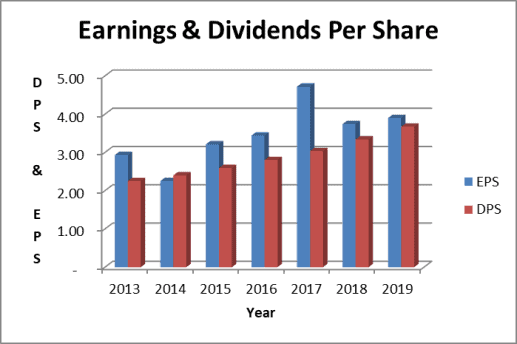 During recent past, the Dominion dividend represented one of the best combinations of current dividend income and dividend growth. So let’s put the Dominion Energy stock dividend under the microscope with a dividend deep dive. Dominion has 3 primary operating segments. First of all, the Power Delivery Group distributes electricity to North Carolina and Virginia. The Gas Infrastructure Group distributes, transmits and stores natural gas to both residential and industrial customers. Service territories include Ohio, the Southeastern United States and the Rocky Mountain region. Finally, the Power Generation Group manages the company’s fleet of power generating stations. Power sources include renewables like water, wind and solar. And more traditional power sources like nuclear, gas, coal and oil. Dominion stock trades under the ticker symbol “D” on the New York Stock Exchange. So if I may refer to Dominion stock as “D stock” for short. And last but not least, D stock is member of the Dividends Deluxe model portfolio. Dominion stock pays an annual forward dividend of $3.67 per share. Based on the recent stock price, that dividend payout puts the Dominion stock dividend yield at a very attractive 5%! Dividend growth from D stock has been impressive too. So let’s check that out next including a few important insights. The historical trend of dividend increases has been impressive. In addition, Dominion has increased their dividend for 15 consecutive years. And for 2019, Dominion announced its dividend would increase another 9.9%. In contrast, I believe future dividend growth will be much lower. My opinion is based on review of their monthly investor presentation slides located on the Dominion investor relations website. For example, this is what I found looking through the presentations as it relates to guidance on future dividend growth. Finally, by late 2018, the company dropped any statements about projected dividend growth. I suspect Dominion dividend growth starting in 2020 will be in line with earnings growth, about 4-5%. This will more closely match other regulated utility stocks and maintain a high, but sustainable dividend payout ratio. Until 2019, revenue held in a pretty tight range. This is typical for a regulated utility stock. 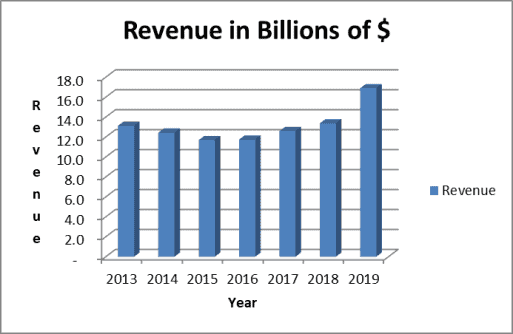 In contrast, projected 2019 revenues are increasing by a sizeable amount. This is due to the acquisition of SCANA that closed early in 2019. Earnings per share have grown over the long run as the company invested in capital improvement projects. The cost of these projects plus a profit margin is then passed on to their customers. This is the essence of a regulated utility business model. The dividend payout ratio is high. It is projected at more than 90% of earnings for 2019. A lower payout ratio is better for the investor. It allows the company to maintain the dividend during difficult times. Or increase it even when earnings are not growing. A higher payout ratio is typical for a regulated utility. And Dominion has a high payout ratio. On the other hand, NextEra Energy is an example of a utility with a lower dividend payout ratio. Leads me to believe dividend growth will be in the 4-5% range in 2020 and beyond. Moody’s and S&P rate Dominion long term bonds Baa2 and BBB, respectively. Their ratings represent “investment grade moderate credit risk” evaluations. And the company’s debt to equity ratio stands at 1.6 times. Dominion, like other utilities, is very capital intensive and needs both debt and equity financing to support its business and grow. This is not a pristine balance sheet, but acceptable in my opinion for a regulated utility. First of all, regulatory relations have traditionally been positive for Dominion. But the political winds can always shift and limit pass through of costs plus a fair profit on growth projects. Furthermore, cost over runs and delays associated with the Atlantic Coast Pipeline (ACP) project may continue. This 600-mile underground pipeline is an interstate natural gas transmission pipeline that would serve multiple public utilities and their growing energy needs in Virginia and North Carolina. Finally, with the SCANA acquisition complete, Dominion’s ability to realize merger savings. In conclusion, uncertainties surrounding the ACP project and the SCANA merger weighed on the stock price in 2018. These risks may continue to pressure the stock in 2019. Let’s look at Dominion stock value from several different angles. Using these assumptions, the dividend discount model calculates fair value at $76 per share. The investment research company, Morningstar, estimates the fair value of Dominion stock at $84 per share. Finally, the Dominion stock price to projected 2019 earnings sits at about 19 times. This is not cheap, but also not significantly over valued. To compare, the S&P 500 forward price to earnings ratio for 2019 stands at about 16 times. Dominion stock is one of my largest holdings. It was one of my original purchases when I established my dividend stock portfolio more than 15 years ago. It has been a rewarding dividend growth stock investment. Based on my expectation that dividend growth will slow, it’s important to purchase the stock with its now substantial dividend yield. Therefore, I would like to add to my position at current price levels. I love safe energy stocks with a high dividend, and indeed own Dominion. There will always be a need for energy, after all. My only concern would be a successful transition to cleaner energy, which I think is the way of the future, however long the transition takes. Good analysis. I owned its’ predecessor, Virginia Electric, but their nuclear exposure scared me off after 3 mile island. Assuming SCANA’s nuclear issues were properly accounted for (and the SC PUC attempts no clawbacks), given a little time should begin rewarding shareholders. I’m more bullish than you on the pipeline, probably because I lost two companies to mergers because of their ownership stakes in natgas pipes. Very nice analysis Tom. Thank you for taking the time. I love my D position in my portfolio and agree with your conclusions. It seems like 2019 will be the final year of management “catching up” their dividend and I expect growth to slow as well. Regardless, it is a great company and I’m happy to have it in my portfolio. It’s a juicy dividend yield and I suspect maintaining that level would be tough for the years to come. The good news is everyone needs some form of energy and once D can adapt to the future, the return for investors can flourish! I love utilities! I plan on adding more FTS (Fortis) when I see a dip. This is one of the few dividend stocks that you are thinking is fairly valued right now. Even though the dividend increases are expected to slow down, for a high-yielder like D, dividend growth in the range of 4-5% would still be very solid. It’s a best-in-class defensive stock and I’m happy to be an owner. Thanks for the great service of analyzing it. Great analysis DD! I enjoy being a shareholder of Dominion. It’s a great utility company. I’ve been looking at this sector recently and D is one of the companies that I continue to consider. I’d like to add to my NEE position but I find them too expensive now, and thus considering opening a new position. Great analysis! Have owned the stock for about a year.